Not great at maintaining your bike? Here are some signs when your bicycle's drivetrain is in need of new parts. For the most part, your racing bicycle needs very little maintenance. A little chain lube from time to time, a quick wipe down after a sweaty ride, or a more detailed wipe down after a rainy training day is about all it takes. Maybe because of how little work bikes typically require, it's easy to forget you're slowly wearing down your parts during every ride. 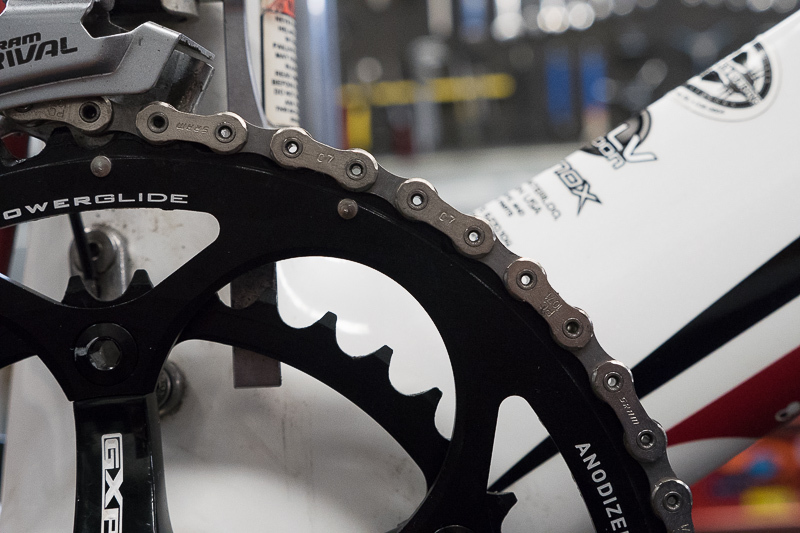 For the drivetrain, you're wearing down your chain, chainrings, cassette, derailleur pulley wheels, and bearings. 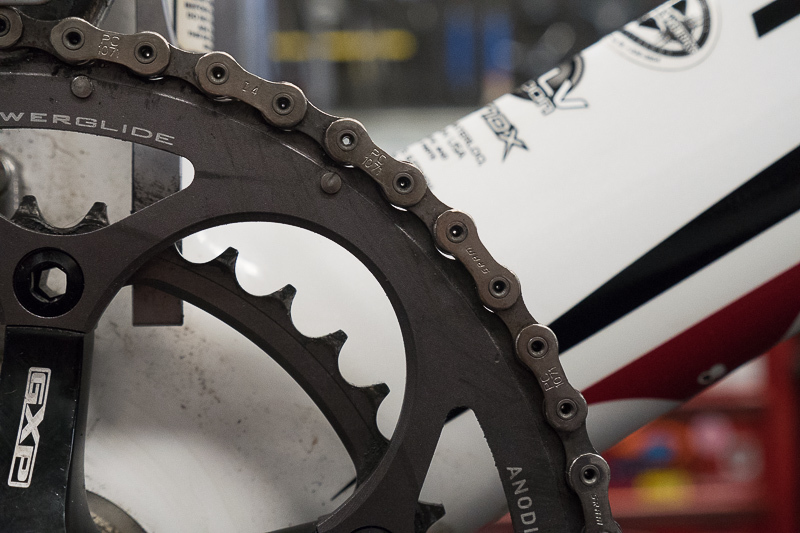 The article is by no means meant to be an exhaustive piece on identifying when your drivetrain needs some attention, but will help you identify when your chain and/or chainrings need to be replaced. Look closely at the image below. See those little gaps between the bottom of the chain and the chainring itself? It's as though the chain is not resting all the way into the valley of the gear teeth. And in fact, that's exactly what's happening. As these parts wear, they stop fitting fully into place. This accelerates the rate of wear, and increases the likelihood of the chain slipping over the teeth. This is most likely to happen under higher torque and when the cassette is well worn (as the cogs of the cassette have less teeth holding the chain in place than the large chainring does in the picture below). The image above is of a worn out chain and worn out chainring. In the image below, we've replaced the chainrings, but not the chain. This helps, you can see the gap between the chain and chainring has decreased slightly, but it's far from perfect. In this instance, the new chainring will wear out much more quickly by using the worn out chain. Best to do the job right and replace both. In the image below we have a new chain with the new chainrings. No light is visible between the chain and ring, as they are fitting perfectly together. You should be able to go through a few chains before replacing your chainrings. This combination should run quiet, smooth, and shift flawlessly. This was an extreme example (the chainring in particular was very well worn), but extreme examples work well in highlighting signs of worn out parts. 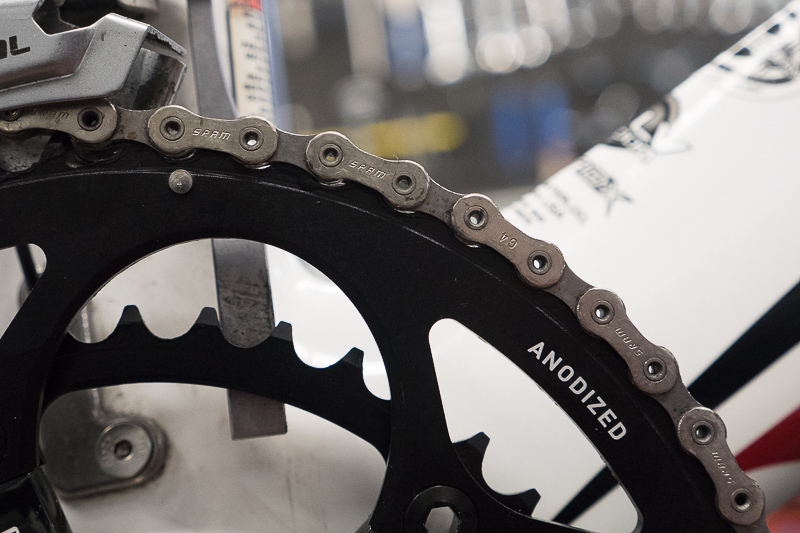 If your bike's drivetrain has gotten to this point, it's likely you'll need to replace not only your chain and chainring, but also your cassette and rear derailleur pulley wheels. Depending upon the version and generation of parts you're dealing with, you can expect to pay ~$150-$700 to have these parts replaced. This is one of the many things we look for when inspecting a client's bike. To learn more about our mechanical services, check out our repair page. Happy riding!